Within five minutes of last Sunday’s NCAA tournament game between the Michigan Wolverines and Florida Gators, there was one thing that became increasingly apparent: the Wolverines were not going to lose. Charging out of the gates with a 13-0 run, Michigan looked like the championship squad everyone was drooling over before the start of the season, and on this Easter Sunday they were playing for a Duck and plum feast while Florida looked content with microwavable dinners and Lunchables. When the final seconds ticked off the clock, Michigan came away with a 79-59 victory and their first trip to the Final Four in 20 years. It’s imperative to take note of this absence, because 20 years ago the Wolverines were led by the Fab Five, a group of young ball-players that not only changed the landscape of college basketball, but helped push hip-hop into the limelight of mainstream commercialism. 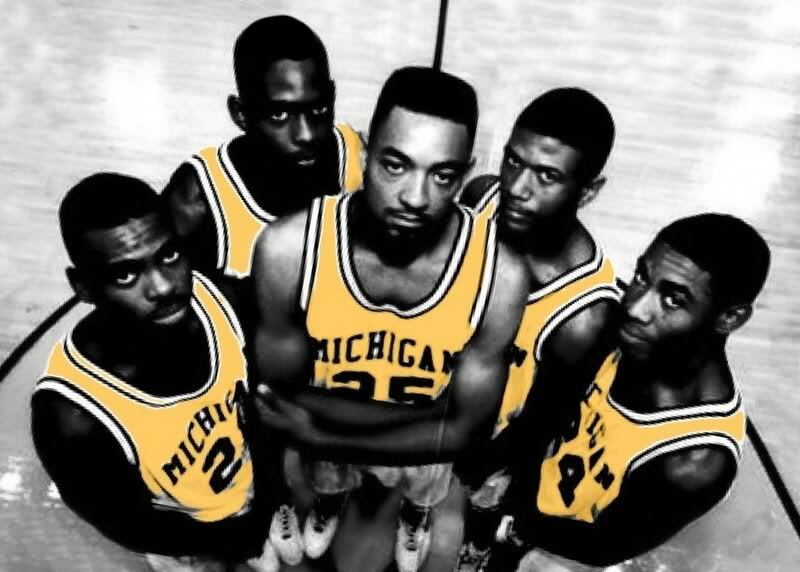 The Fab Five is the name given to Michigan basketball’s 1991 recruiting class, which is considered one of the greatest recruiting classes of all time. 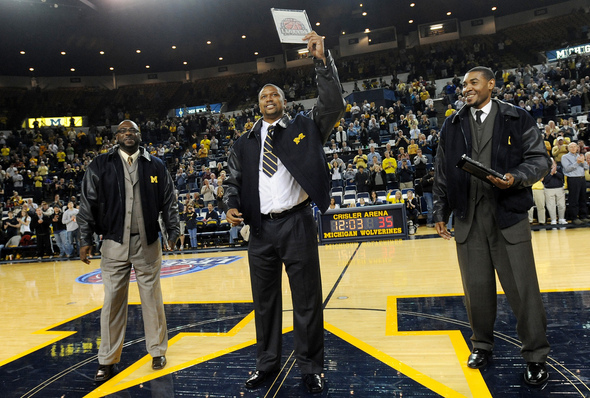 The group consisted of: Chris Webber and Jalen Rose, two players from Detroit with opposing backgrounds and schools; Jimmy King and Ray Jackson, two high school stars from Texas; and Juwan Howard, the city player from Chicago’s Vocational Career Academy who was perhaps the biggest factor in getting the Fab Five together in Ann Arbor. 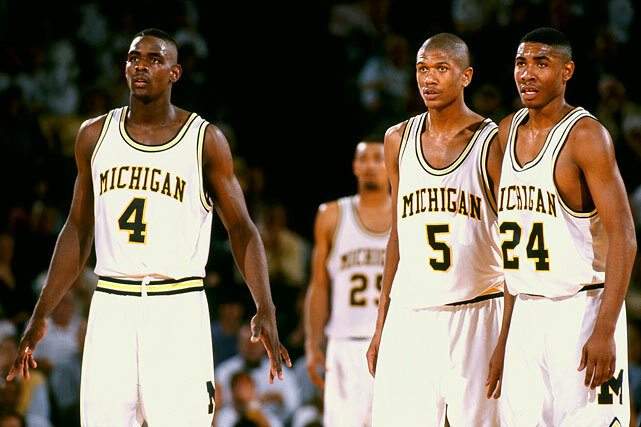 They led the Michigan Wolverines to both the 1992 and 1993 NCAA Men’s Division 1 National Championship as freshmen and sophomores and started 304 games together. From a recruiting standpoint, the class featured four McDonald’s All American’s (Ray Jackson being the exception), and Webber was #1, Howard was #3, Rose was #6, King was #9 and Jackson was #84 on the 1991 high school recruit top 100. As talented as The Fab Five were, they never won a championship. As freshmen in 1992 they lost to Duke 71-51 and during their sophomore year in 1993 they lost to North Carolina (77-71) in a game that is most remembered by fans as Chris Webber’s late game “no timeouts left” meltdown. Despite this, the Fab Five will go down in basketball lore and is best remembered as a group of extremely talented basketball players that pioneered a new way to approach college basketball. More uniquely however, the Fab Five helped pave the road for hip-hop during a time where the genre and culture itself was at a distinct crossroads. By 1992 hip-hop was both peaking and divulging from its core at the same time, which featured a continual swelling and mixing of influence and imagination. Before 36 Chambers, Midnight Marauders and 93 ‘Til Infinity, hip-hop was already forming its vast identity. As hip-hop and dance battling continued to reduce gang related violence and crime, the early 90s also saw a rise in crime-related rap albums that dominated commercial streams. 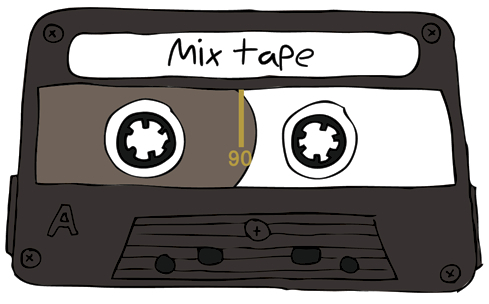 With every feature such as Pete Rock and CL Smooth’s Mecca and the Soul Brother and Eric B. & Rakim’s Don’t Sweat the Technique, it was met with more aggressive works such as Da Lench Mob’s Guerillas in tha Mist and Dr. Dre’s classic The Chronic. It wasn’t here where hip-hop first featured these unique clashes of subject matter, but it was a first in terms of extent and availability. For the first time hip-hop was molding itself into a culture with sub-genres that sprayed haphazardly in varying directions. As N.W.A.’s 1988 classic Straight Outta Compton did before, these cuts in the early 90s broadened the hip-hop worldview; The Chronic helped drive G Funk and West Coast hip-hop into the mainframe, Das EFX’s Dead Serious monumentally sprawled new rhyme schemes into the genre with perplexing bars that captivated the culture, Point Blank’s Prone to Bad Dreams helped showcase the South’s contributions and Gang Starr’s Daily Operation continued to weave stories of urban reflection into music that paid respect to music before its time. 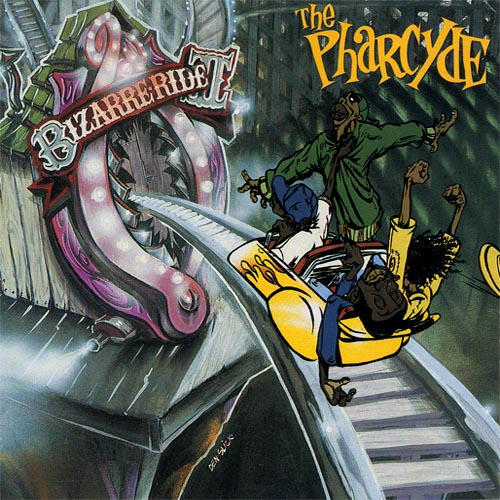 Released in 1992, The Pharcyde’s “Bizarre Ride II” was an important west coast hip-hop album that further moved the genre along. With such a rise, hip-hop was still short of being fully recognized as a culture, and who would have thought a group of kids playing basketball would help quell that problem. The most recognizable feature of the Fab Five is something that still exists today, and this is why they’re so important. From the baggy shorts that far exceed the knees to the eccentric basketball shoes and pre-game headphones, the Fab Five conspicuously brought to basketball a new edge never before seen that now dominates the sport. More important however is how this group single handedly created a moment in bringing hip-hop culture and urban youth style to the court. If influence counts for something, the Fab Five takes the whole pie. In the early 90s college basketball featured a staggering amount of schools that had rosters mostly dominated by black players. However, the rebellious nature of hip-hop culture and urban style of play was nowhere to be seen in the sport; teams still ran structured plays, coaches emphasized singular offensive styles and defense was up-front and basic. The Fab Five slashed through this rhetoric, and with them they brought the hip-hop counter-argument to the sport. These harbingers of change sought out new ways to play the game. Instead of running designed pick and rolls, they ran back cuts for alley-oops. Instead of just “winning,” their goal was to win with style. And instead of conforming to the norm, they unleashed upon the world their own voice. They sported black socks and baggy shorts. They listened to EPMD before games. They talked loud on the court and even louder towards their opponents; and they were all swagger before swagger even became a thing. For Jalen Rose, Duke was the oppressive force that omitted people like him, and he was the one standing up having a say. He had a voice, and he had his view, and with The University of Michigan he was allowed to showcase this. As the Fab Five name stormed across the country and around the world, hip-hop culture was met with spikes in commercial success. Jersey companies were selling Michigan apparel and socks, kids were trading in Nirvana shirts for EPMD records and urban youth culture was being imitated by suburban middle to upper class schools while basketball teams wanted to be “cool” and “the Fab Five.” It was a quick flow of change and difference to a culture so struck on normality, and that is perhaps why the Fab Five image is so influential. However, with all of the successes in the rise of hip-hop culture and changes to the game of basketball, not everything was positive. As the Fab Five image and moniker grew to its utmost height, so did ignorant thinking. Because these kids were black and represented a rebellious side to the game, fans and critics alike started to put basketball and black together in non-positive ways. The truth is that color has no bearing on basketball, but after the rise of the Fab Five, black and basketball became synonymous to an extreme degree. We see this unfortunate trait to this day, where players like Doug McDermott, Jimmer Fredette and Adam Morrison are good basketball players “for being white,” and teams like the Minnesota Timberwolves and Butler Bulldogs are chastised for “having too many white players.” In 2010 when Butler and Duke faced off in the championship game, six out of the ten starters on the floor were white, and this was noted among fans and even critics. Like basketball, color has no bearing on hip-hop, which is usually considered “a black thing” to most people even to this day. The fact is that hip-hop is worldly, and there is no bearing. Where would Nas be without MC Serch, the white MC from New York who basically sought out Nas and was the executive producer behind Illmatic? How would hip-hop be without The Beastie Boys? Or Atmosphere? Or Eyedea? Or Eminem? What about hip-hop artists from around the world like Tommy Tee (Norway), Drunken Tiger (Korea), Bushido (Germany), and Pete Philly & Perquisite (Netherlands)? For one, hip-hop wouldn’t nearly be what it is now. With all that has been said, it’s important to remember the Fab Five as an important movement in hip-hop and basketball. In a day when hip-hop was still looking for a major voice, these kids helped propel its popularity to the third degree. They were rebellious and different and had “a voice,” while at the same time appealing to the majority of basketball and hip-hop culture. Furthermore, they brought with them a new look and feel to culture. Despite some of the negative influences the Fab Five brought (I won’t even mention the Ed Martin scandal), they were for the most part a positive image for hip-hop and its growth. While bringing about these positive changes, they constantly remind us that there is no bearing to hip-hop, which might be the most important lesson to this story. So when Michigan takes the floor this coming Saturday against Syracuse in the Final Four, I will be rooting for them. Not only because they’re representing the Big Ten, but because in a way, they’re a constant reminder of what once and the evolution of hip-hop. The University of Michigan will always be tied to the Fab Five, and the Fab Five to the University. Events and people like the Fab Five only come around once in a blue moon, and in a world where studying and recognizing our past for the betterment of ourselves is a priority, those five players from the 1991 recruiting class should never be forgotten.